Ply lining a vehicle makes perfect sense. It protects your vehicle from everyday wear and tear and as a result, extending the vehicle life span. 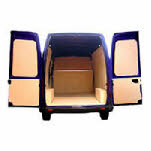 It also becomes a valuable asset to a vehicle when carrying loads by preventing any panel damage. 9mm floor / wheel arch boxes. Cosmetic protection strips on all door edges.